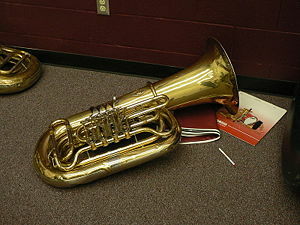 A tuba is a large brass wind instrument, the lowest in pitch of all commonly employed wind instruments. It is played vertically and has 3 to 5 values. It is used to provide a bass-line in brass bands and some traditional jazz bands. In classical music, it is used more for its distinctive tone in coloristic effects, particularly from the late 19th century - Richard Wagner and Richard Strauss, for example, employed it as a part of their rich orchestral pallettes. The English composer, Ralph Vaughan Williams, wrote a tuba concerto that has been frequently recorded. There is a tenor version in B flat, called in England, the Euphonium, in Germany, the Barytone and sometimes in Italy, the Bombarda. Also, various bass versions of the tuba exist, mainly heard in Wagner or the occasional brass band. Adolphe Sax, who invented the Saxophone developed an instrument, the "Saxhorn", bass versions of which are considered part of the tuba family. This page was last modified on 15 March 2009, at 21:52.